Here is how to replace the front VTEC gasket on a 2008-2017 honda odyssey. This video will also apply to accords, pilots, etc that have the same assembly design. Replaced my gaskets and they did not fit well. Installed them anyway and I still have a leak. The gaskets were low quality and was obvious that there was zero quality control based off of all of the extra gasket material from the molding process. Guess I need to buy a new OEM spool valve now. Wasted 20 dollars on those garbage gaskets. Hi, does anybody have a video that shows how to completely change the whole spool valve (front) for 2010 Odyssey? Going to try this gasket fix but would like to know how to change the valve assembly if any leaking happens again. I was wondering how oil was collecting around my dipstick. Great video and looks like a pretty easy fix. This is really good video. I was being asked to pay over $500.00 to fix the leak. 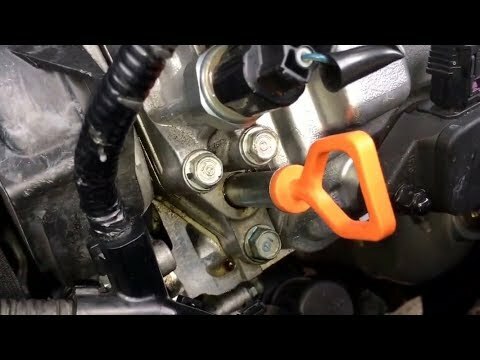 I bought the gaskets on Amazon for 12 dollars and without any experience, first time car owner, I managed to follow the video instructions and did it. Beware one of the two little metal pieces that hold the solenoid came off and fall. After a while thinking I messed up, I finally found it by the radiator fans. I was very lucky and finished the project. No leaks so far. Thank you so much for this video, well made. Im pretty sure that's my problem cause I see oil on top of my alternator. Thank god my alternator still good. Will order gaskets right now and take care of it. Thanks again. I would to have a $1 for every time MrRangerZR1 has taken the top cover off a 3.5L engine! Thank you for posting this video…and a link to the necessary parts. I was unable to find them locally. However, your links to online suppliers have alleviated that headache. Very helpful video. Thank you. Just got my gaskets. Changed out both of them. One of the gaskets wouldn’t stay in place. But I think I held it in place enough to tighten the 3 bolts. Got them all tight evenly. So wish me luck with this easy procedure. I compared the old gaskets with the new ones. Those old ones were just flat and one of them kind of broke apart. I hope this fixed the leak. Hello . Love your videos . I subscribed a few weeks ago . Question for you sir . FRESH OIL CHANGE VERIFIED THAT IT WAS FULL ON DIPSTICK. CLEANED THE EGR Valve . Can the VCM cause this ? I clear the codes . Start the vehicle again just on driveway at home and there comes the check engine light again . Engine shakes . CAN THIS VTEC PART YOU ARE CHANGING FILTER ON BE THE REASON ? man im lost . I have checked all Hoses and all conections . Im about to give up . Hello I've been having issues with frying alternators. Found this leaking, hopefully this will fix the issue. I put both gaskets. They lasted 2 months. :/ Leaking again. Damn, I couldn't find the gasket last year, had to buy the whole solenoid, at almost $500 Thanks for sharing this for people. Link for gaskets in the description. I hope this video and comments are still alive. My friend has a 2010 Accord Ex V6. I believe I just need to replace the o-ring gaskets on the upper half. Her car died while driving and she towed to dealer. They wanted $1800 to replace the fried alternator and the spool valve. Alternator apparently died from oil dripping down into it from a leaky spool valve. I replaced the alternator for under $200. The Honda PN for the whole valve is 15810-R70-A04. These gaskets should work correct? Do you have a link to purchase them? Hi, MrRangerZr1 those gaskets are new right? Are those made by Generic Manufacturer? I mean if I replace those gaskets, I don`t have to buy the valve from Honda right ? (whole valve 15810-R70-A04) thanks! Hi, does this fix and replacement part numbers work on 2008 honda accord V6? thank you!